Participating in Kim O'Donnel's Table Talk chat today, I got all excited about garlic scapes. Taking a break from writing to go to the Farmers' Market was on my mind anyway, so this was just the break I needed. One vendor had the scapes - I bought a large, tangly mass of them. Since I'm allergic to walnuts (we think) but tolerate almonds in small doses I used almonds, parmigiano reggiano, good olive oil and scapes. We had some steak tips for dinner (what an odd New England thing? Our first.) with some lovely Koda Farms brown rice mix (quinoa, flax added to heirloom brown rice), and a salad with radish and cucumbers from the market, lettuce from the garden. Wow wow wow. 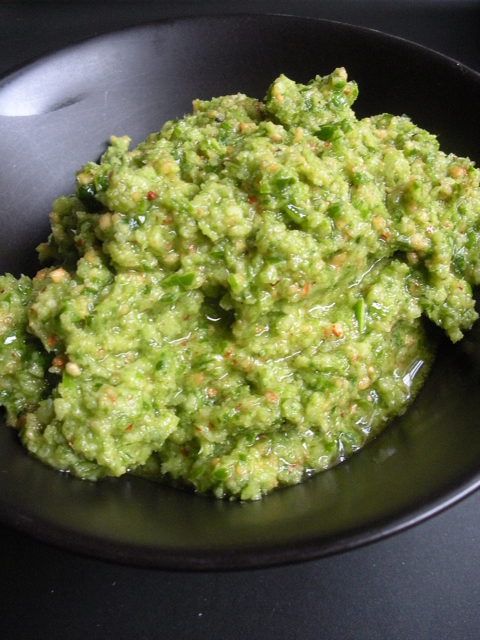 New HUGE fan of garlic scape pesto! Had some mixed into my rice. Tomorrow will have with pasta.